This has been a busy and exciting time for all of us on the OneDrive team. Last week, we unveiled more features coming with Windows 10 including how you can use Cortana to search your OneDrive, how you will be able to have your music available through Xbox Music, and how OneDrive will work with the all-new Photos app. Today, I’m eager to build upon what we demoed in Windows 10 and announce a number of updates centered on making your OneDrive photo experience richer and smarter. Key updates coming over the next couple of weeks include: adding the ability for customers to curate photos from their phone, desktop, and inbox quickly and simply; a new feature that allows you to view, manage, and share photos with Albums; and finally, through a partnership with Bing, customers can now search for their files and photos in a new and exciting way! 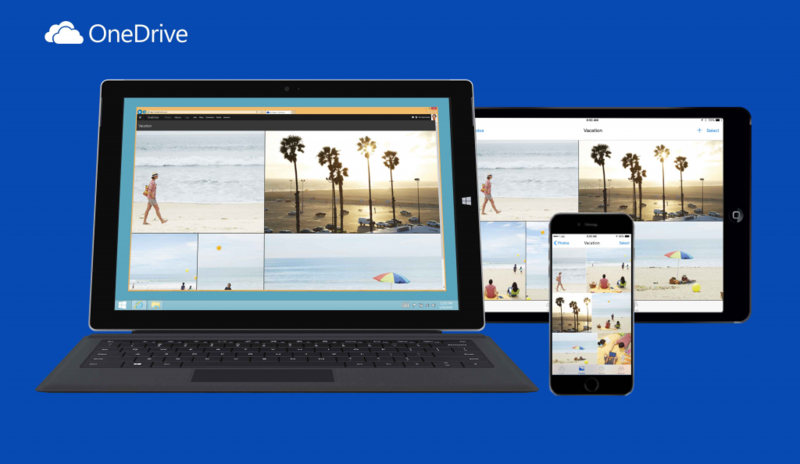 OneDrive is the one place for all of your files, and we want OneDrive to be the best place for all of your photos, too. They’re some of the most important and special types of files that we create. They help us document our lives and share precious memories with friends and family. And it is awesome that millions of people rely on OneDrive to be the one place that they use to back up and save their photos. But to date, we haven’t really offered our users a great way to experience those photos. That changes today. 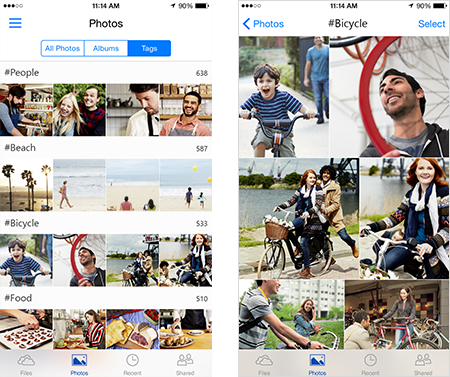 With the update outlined below, you’ll have new ways to get your photos in OneDrive. They’ll also be more beautiful. They’ll be quicker to find. And, more importantly, they’ll be even easier to share. We know that your photos are everywhere. You take pictures every day with your phone and capture special events or trips with your DSLR. You archive them all on your desktop or your external hard drive, and if you’re like most of us, you have too many sitting in your inbox, attached to messages from friends and family members. OneDrive has always made it easy to automatically upload the photos and videos you take on your phone – just use the Android, iOS, or Windows Phone app to back them up. And to make sure you have enough room, when you turn on camera backup, we automatically double the amount of space you get for free. That’s 30 GB of free storage, which is enough for over 12,000 photos, helps you manage the limited storage capacity you have on your phone, and is plenty of space for you to add all of your photos from your different devices. Over the next month, OneDrive users on Windows 7 and 8 will also be able to automatically import photos from devices that they connect to their computer and easily save screenshots that they take right to OneDrive. This will make it easy to back up photos from your camera, USB stick, or external hard drive to not only your computer, but also to the cloud. These photos will be saved in a new “Camera imports” folder, and similarly, we’ll let you automatically save screenshots that you take to a new “Screenshots” folder. The screenshots will still save to your clipboard like you’re used to, but now you’ll have another copy that is easy to share and available to you from any device. And what about all of those photos in your inbox? Well, in case you missed it, earlier this month we made it possible to quickly save any attachment to OneDrive from Outlook.com. We recognize that many people share and receive photos via email. So allowing you to just one-click save them to your OneDrive makes it easier to back up all of those photos and to find them as well. 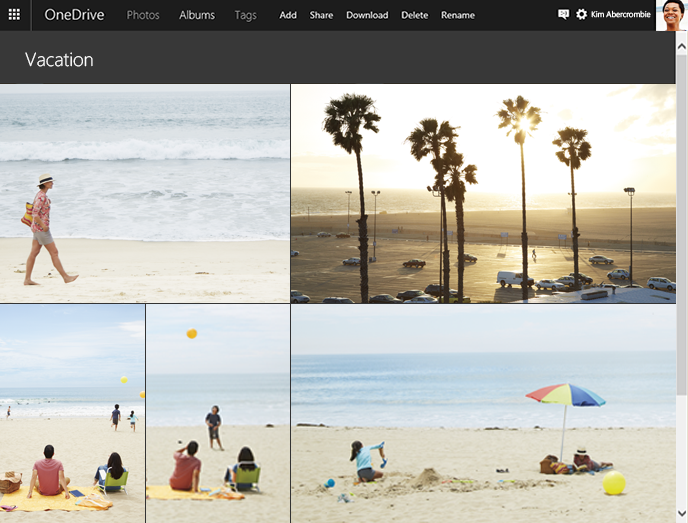 OneDrive has offered a single all photos view for some time now. It lets you see your photos from any folder in your OneDrive, arranged together chronologically. This view automatically brings photos together from your camera roll with photos you’ve imported from your PC or saved from your email. And we’ve enhanced this view to show your photos grouped together by time and location, and to let you quickly jump around to see photos grouped by month. But starting today, we have a brand new way to view, manage, and share your photos with Albums. Unlike traditional folders, Albums let your photos stand front and center. Thumbnails are larger, photos are edge-to-edge, and everything is arranged together into a beautiful collage. When you open a photo, it now fills up the whole screen. Information details are still available, but from a pop-up menu, so now your photos stand out like they were always meant to! 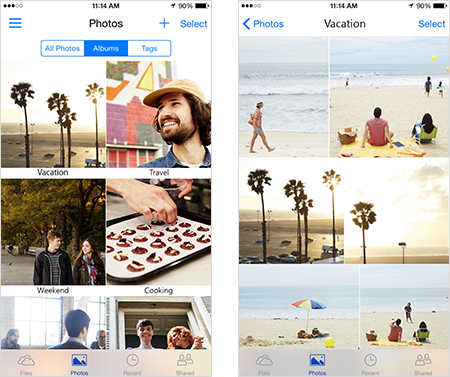 Albums also let you bring photos and videos together from anywhere in your OneDrive. You don’t need to copy files from other folders. That means you can easily create an album using photos from your phone in your camera roll folder, your camera in your “European Vacation 2012” folder, or from your email, with the photos you saved to your attachments folder. And even more, you can also add to your albums after they’ve been created and shared. We’ve also made sure that the people you share albums with will have a great experience. They’ll see the same beautiful Albums view that you see from their desktop, on their phone in the mobile browser, or even in our mobile apps. Albums will be coming first to the web and our iOS app today, and Android and Windows Phone are coming soon. In addition to making your photos experience richer visually, we’ve also made progress in making it smarter by empowering you to actually do more with them. 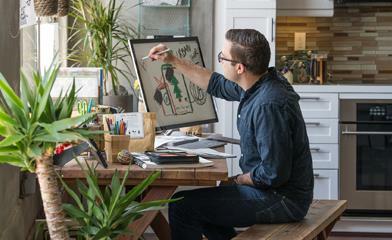 We’ve partnered closely with Bing to help OneDrive users quickly find what they’re looking for from OneDrive.com. You can now search for Office documents and PDFs by text inside of them and photos based on time, location, or text that is extracted from images themselves. You can also search for photos based on tags – both ones you manually created and ones that we’ve automatically identified. 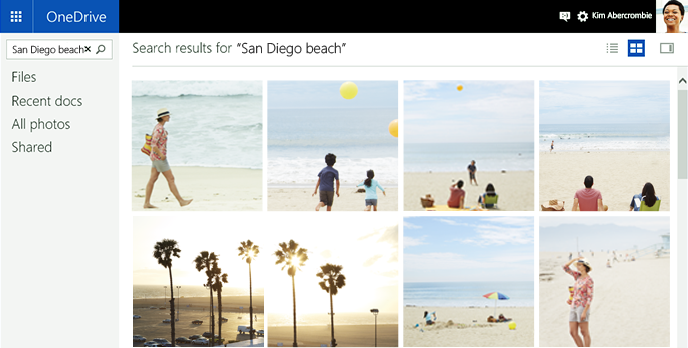 With the help of Bing and Microsoft Research, OneDrive can now automatically recognize content in your photos based purely on the visuals, and what that allows you to do is really amazing. Our users will have access to automatically grouped collections of photos and they can easily search for specific ones. You’ll be able to quickly find things such as “people,” “dogs,” “whiteboard,” “beach,” “sunsets,” and dozens of other terms. This makes it even easier to add your photos in to presentations for school, to relive a specific memory, or to share something important with all of your friends on Facebook. From the new Tags view, you’ll be able to see your top tags – including both manually and automatically-generated ones. And what shows up today is really just the start. The database of tags will continue to grow over time, and we’re working on new and innovative ways to utilize this information to help you be more productive, find your photos more quickly, and help you make them better. If you’re interested in learning more about how the technology works, take a look at this article from Microsoft Research. In addition to making it easier to get your photos and videos in to OneDrive, we’re also exploring new ways to help you engage with and share them. The first of which will be our Weekend Recap emails, which are just starting to roll out. Imagine that you were the photographer at a friend’s birthday party on Saturday or that you just finished a remodeling project at home over the weekend and you took a bunch of photos to capture your work. 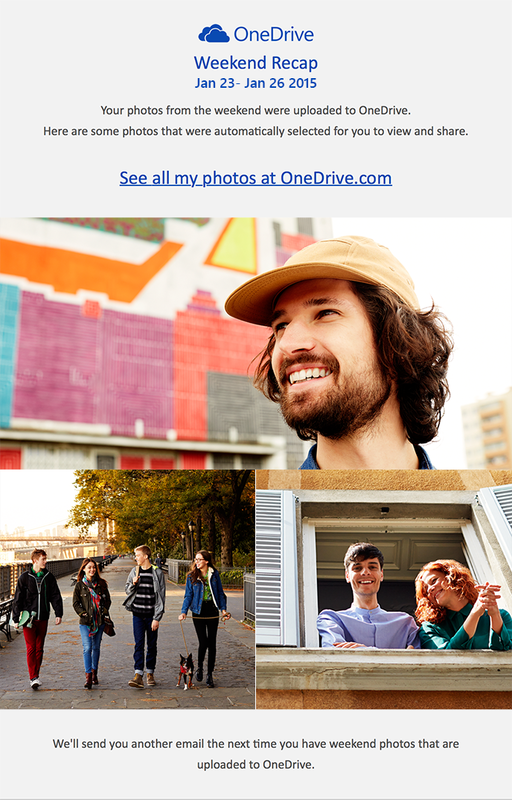 OneDrive will automatically find those photos and send a few of them to you in an email. Not only will you be able to enjoy them again on Monday, but you can quickly send them to your friends or family for them to see as well! We’ll look to do more with these types of emails and notifications in the future, as we want to make it easier for you to relive the memories that you have saved in OneDrive and to share them when you want to. This starts rolling out on web and iOS today, with updates on Android and Windows Phone not far behind. We hope you’re as excited about these changes as we are. So go check out the new photo experiences and let us know what you think on UserVoice. Editor’s note 2/11/2015: The technology behind OneDrive photo search recently surpassed human recognition abilities in the ImageNet test. Please read this article if you’d like more information.